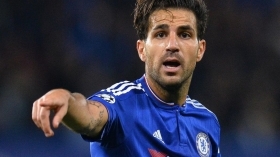 AC Milan sporting director Leonardo has acknowledged that the club were interested in signing Chelsea midfielder Cesc Fabregas during the summer transfer window. The Spain international has just seven months remaining on his existing deal with the Blues and this has recently increased speculation of him parting ways with the club. Amidst this, Leonardo has disclosed that the Rossoneri had planned an approach for the Spaniard last summer but the deal could not materialise amid their Financial Fair Play concerns. "We evaluated it, considering the possibility, but didn't go all in. We are still evaluating the conditions," he is quoted as saying by the Evening Standard. "There could be an economic sanction, we'll see what happens." Chelsea boss Maurizio Sarri has already expressed his desire to keep the Spaniard at the club beyond the current season but so far, there has been no progress with the Blues reluctant to meet the midfielder's demands for a long-term deal. Chelsea have maintained a shrewd policy of offering only one-year extensions to players aged above 30 and they are said to be maintaining the same stance on Fabregas' position.